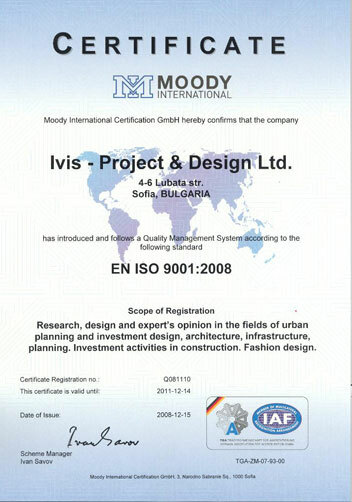 The company IVIS – Project and Design Ltd. more than 18 years actively participates on the design market. Its major sphere of activities is design of industrial, residential and public buildings, making plans of existing buildings and facilities with the aim of legalizing them in part Architecture, Construction, Geodesy, Water and Sewage Systems, Electrical, HVAC, Vertical Planning and Health and Safety Plans. We have extensive experience in the production of designs in the sphere of winter ski sports facilities and tourism. Specification and drawing of the plan for the necessary areas around the buildings according to the normative acts. Garden designing of many private and public properties. In its activity the company IVIS – Project and Design Ltd. has successfully worked in partnership with and inviting experts for its projects from the National Centre for Territorial Development and Housing Policy, Agrolesproject, Administration of Geodesy and Cartography, and other private, state and international consulting bureaus and companies. The qualification and the professional experience of the specialists with whom the company works guarantee the quality and the timely execution and delivery of all contracted works, designs and contracts. You can entrust us with your dreams and we will create for you the ideal surroundings for living, entertainment, work and recreation.